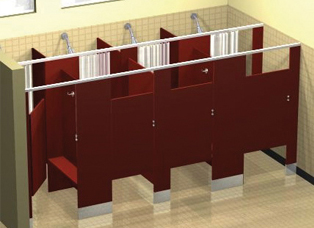 Accurate Partitions’ shower dividers and dressing booths are strong and durable to hold up in public shower areas. Accurate offers materials that resist penetration by water, steam, mildew, odors and soap. The clean, modern design is attractive as well. Dressing Booths enhance shower installations—available with door or curtain options. Available in solid plastic and phenolic. Accurate Partitions also offers architects the option to specify vanities that match our most water-resistant partitions: black core phenolic, color-thru phenolic and solid plastic. Vanities have a depth of 24", are available in panels up to 10’ in length and come standard with a backsplash, two side-splashes and an underneath apron. ©2019 Accurate Partitions Corp., an ASI Group Company. 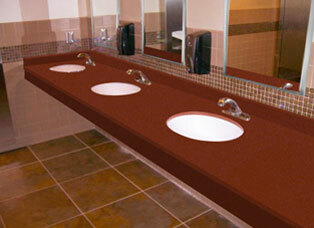 Accurate Partitions Corp. reserves the right to make design changes or to withdraw any design without notice.